The Contract is with Bamboo Amazon Tours Cia. Ltda. “the Company”. By booking a trip, you agree to be bound by these Terms and Conditions that govern the relationship, the cancellation policy and limitations of liability. These Terms and Conditions affect your rights and designate the governing law and forum for the resolution of any and all disputes. A booking is accepted and becomes definite only from the date when the Company sends a confirmation invoice or email. It is at this time that a Contract between the Company and the Client comes into existence. The Company will hold the reservation of the client for 14 days from confirmation. To secure a booking with Bamboo Amazon Tours Cia. Ltda., the client must deposit 50% of the trip price. In case of non-payment within the 14 days the Company will treat the reservation as canceled by the Client..
a)The balance due must be paid to the Company no later than 14 days prior to departure. b) In the case of bookings made 15 days to 8 days prior the departure date, the advance payment must be made within 3 days. In case of bookings made 5 days or less of the departure date the Company offers total payment upon arrival in Lago Agrio. c) Payment can be made trough Paypal, bank transfer or deposit. In the case of transfer fees (Paypal 5% or international bank transfers) all charges applied to the transaction should be assumed by the Client. d) All prices are United States Dollar based. full cancellation fees to the Client. Some trips may be unsuitable for Clients due to age, mobility, disability, pregnancy or physical or mental conditions. It is the Client’s responsibility to check prior to booking. The Company may refuse to carry pregnant women over 28 weeks or Clients with certain conditions. The Company is not required to provide any special facilities unless it has agreed to do so in writing. The Company will do its best to meet Clients special requests including dietary, but such requests do not form part of the Contract and therefore the Company is not liable for not providing these requests. Medical facilities vary from country to country and the Company makes no representations and gives no warranties in relation to the standard of such treatment. The Client reserves the right to cancel any trip for any reason. Any cancellation by a Client must be made in writing and be acknowledged by the Company in writing. The date on which the request to cancel is received by the Company or its Agents will determine the cancellation fees applicable. (a) Cancellation for trips: The cancellation fees are expressed hereafter as a percentage of the total tour price, excluding insurance and international flights. (III) have a full refund of all monies paid under the contract as soon as possible. The prices on our website are based on rates and costs in effect at time of posting to the website. The Company reserves the right to alter prices at any time prior to payment. All dates, itineraries and prices are indicative only. flight cancellations, strikes, events emanating from political disputes, entry or border difficulties, extreme weather and other unpredictable or unforeseeable circumstances or any other reason whatsoever. At all times the decision of the Company’s tour guide or representative will be final on all matters likely to endanger the safety and well-being of the tour. By booking with the Company, the Client agrees to abide by the authority of the tour leader or Company representative. The Client must at all times strictly comply with the laws, customs, and foreign exchange and drug regulations of all countries visited. If the Client is affected by any condition, medical or otherwise, that might affect other people’s enjoyment of the tour; the Client must advise Bamboo Amazon Tours Cia. Ltda. at the time of booking. Should the Client fail to comply with the above or commit any illegal act when on the tour or, if in the opinion of the tour leader, the Client’s behavior is causing or is likely to cause danger, distress or annoyance to others the Company may terminate that Client’s travel arrangements without any liability on the Company’s part and the Client will not be entitled to any refund for unused or missed services or costs incurred resulting from the termination of the travel arrangements. The Company guarantees selected departures at their discretion. This guarantee of departure is still subject to force majeure situations and the Company reserves the right to remove the guaranteed designation at any time due to circumstances beyond reasonable control. The Company will not be held accountable for any indirect cost resulting to the client for this action. whatsoever beyond the reasonable control of the Company the consequences of which could not have been avoided even if all due care had been exercised; or an event which the Company or the supplier of services, even with all due care, could not foresee. the Client is required to obtain separate coverage at an additional cost. When obtaining travel insurance the Client must ensure the insurer is aware of the type of travel to be undertaken. If a Client has a complaint against the Company, the Client must first inform the tour guide at the earliest opportunity to allow the grievance to be rectified. If satisfaction is not reached, contact Bamboo Amazon Tours Cia. Ltda office in Lago Agrio whilst on tour in order that the Company is provided the opportunity to rectify the matter. Failure to indicate dissatisfaction whilst on tour will result in the Client’s ability to claim compensation from the Company being extinguished or at least reduced. If satisfaction is still not reached through these means on tour then any further complaint must be put in writing to the Company at bambooecolodge@gmail.com within 15 days of the end of the tour. The Company will not accept any liability for claims received after this period. such travel conditions. The Client is solely responsible for acquainting themselves with customs, weather conditions, physical challenges and laws in effect at each stop along the itinerary, and are encouraged to locate or make contact prior to embarkation with his/her local embassy or consulate in each destination. 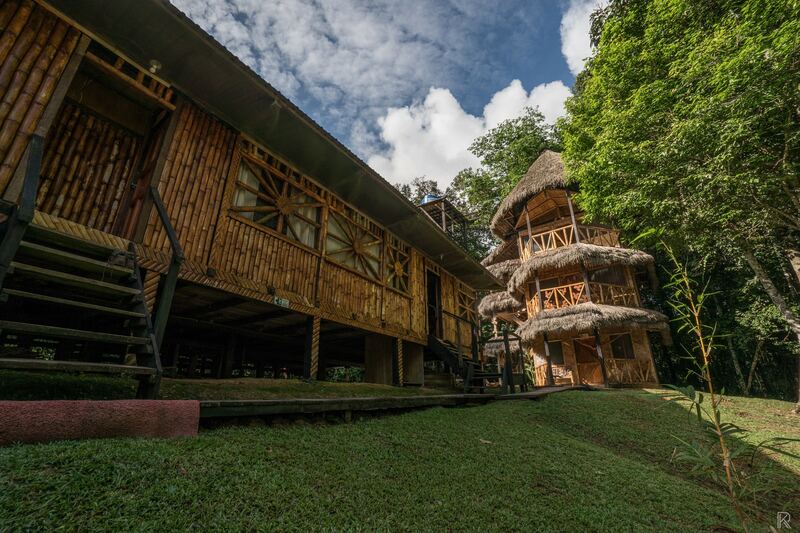 Book your Bamboo Amazon Tour now ! Step1: Fill in the form. Step 2: We will send your confirmation within 48 hours. Step 3: Check the details of your reservation and reconfirm. Food restrictions: Vegetarian? Vegan? Alergies? A down payment of 50% is required, except of last minute booking (3 days or less prior to departure). You can pay in USD or EUR within 2 weeks form getting your booking confirmation. Payment options are through bank transfer (ecuadorian (USD) or german (EUR) bank account or through Paypal (+5% transfer fee). If you would like to pay 50% upon arrival or the whole amount in case of last minute booking, please note that we only accept cash payment in USD upon arrival. If you arrive by public bus in Lago Agrio you can take a taxi ($2) from the bus terminal to our office. We will send you a map with your booking confirmation. It’s no problem if you arrive very early. You have time to relax and to have breakfast (included) until th Bamboo Lodge transport will pick you up from at 9.30 am. If you arrive by car you can park it at here savly during the tour. If you book our private transport the pick up is the night before your tour starts at 11pm from the Secret Garden Hostel, Old town, Qutio. We send you a map link in your booking confirmation. The private transport will drop you off in the early morning at our pick up point in Lago Agrio at the Bamboo Lodge office where you have time to relax and have breakfast (incl. ), the tour starts at 9.30am. There is no extra charge for the Airport pick up if arrival time is until 10.45am. There is an extra charge of US$30 per person if arrival is between 10.45am – 1.00pm (min. 2 people). Unfortunately if you arrive later then 1.00pm in Lago Agrio we cannot organize the tour start on the same day. Please send the name of the Hotel in Lago Agrio in our Booking form . We will pick you up directly from your hotel between 9am – 9.30am. (Pick up directly to Bamboo Lodge, no breakfast included).